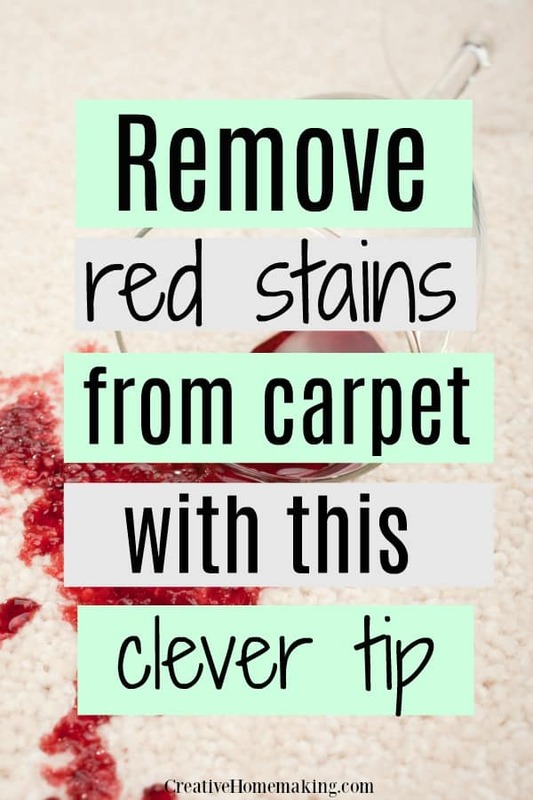 January 21, 2017 0 comments on "How to Remove Red Stains from Carpet"
I’m really excited. I just did something I never thought I would be able to do. I just removed a red stain (actually 5 red stains!) from my off-white carpet. Last year when we were selling our home and wanted our carpet to look brand new, we hired a carpet cleaning professional to remove the stains from our carpet. It was like magic. He had a bunch of different chemicals he used, and in talking with him, I found it very interesting that he used different chemicals on different types of stains. One stain remover can get any stain out, right? Apparently not. The other thing that was interesting was that he used an iron to get all of the stains out, not a steam cleaner. He didn’t use any water at all. Well he did a great job getting all those stains out. Then we moved. At our new house the former owners left us some carpet stains behind. I have been trying to ignore them. 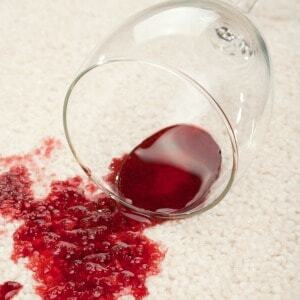 But it is hard to ignore red stains on off-white carpet! I was thinking about having the carpet guy come to visit us at our new house, when I ran across a tip that I had to try. According to the tip, all you need is a spray bottle and a mixture of half ammonia, half water. Spray the red stain with this mixture, lay a cloth on top of the stain, and apply heat from an iron. Repeat until the stain is gone. That’s it! For dark stains you may need to re-spray and re-iron four or five times. The key is to soak the stain really well with the spray and the press the tip of the iron directly on the stain. Please note that this ammonia mixture is highly toxic. Do this on a day when you can open up the windows and air out the house. You don’t want to breathe the fumes or touch the ammonia. Keep children and pets away from where you are working. I tried this solution on another type of stain, and for some reason it didn’t work as well. As the carpet guy said, different colors/kinds of stains need to be removed by different methods. The combination of the ammonia and the heat from the iron work very, very well on red stains. I was able to use this method to remove 5 different red stains on my stairway, in the entry way to our home, and in our family room. I couldn’t be happier. Most food and pet stains I have been able to get out with our carpet cleaner, along with carpet cleaning solution. Not the red stains (Kool-Aid, popsicles, etc.). Those are stubborn you-know-whats. I am not afraid of them anymore! Note: You should test an inconspicuous area of your carpet with the spray first to make sure it doesn’t harm your carpet. You should be able to use it on any color carpet. The ammonia shouldn’t discolor your carpet like bleach would.